We are offering a tune up special at the price of $49.95. For customers in Volusia County. We are offering $200.00 off of any installation of a complete system if you contact us through our website. Let Climate Makers of Central Florida help you get the financing you need to get the comfort you need in your home with easy same day financing. We offer a fast and easy application process and give you total control over the type of loan you would like and make the decision on how long it will take you to pay it back. You can pay your loan back in a matter of 24-36 months, 37-48 months, or longer. Low, Fixed- Interest Rates: When you've worked hard to build solid credit, your interest rate should be low, and it should be fixed. Loan rates start as low as 3.99%APR with Autopay, with loan amounts ranging from $5,000 to $100,000. Leave your Home Equity Intact: An unsecured loan allows you to preserve and enhance your home equity, rather than deplete it, You also get a virtually paperless loan, with funds in your account as soon as the day you apply. So contact us today and get approved on the easiest loan process you've ever experienced through LIGHTSTREAM. Twice a year preventative maintenance energy saving plan. Only $115.95 per year. Twice a year preventative maintenance energy saving plan. 15% off parts & 10% off 2 system. Only $149.95 per year. Twice a year preventative maintenance energy saving plan. 20% off parts and 20% off labor. Only $199.95 per year. Climate Makers has worked with all major brands, so rest assured that we have the knowledge to service and repair even the toughest units. Sales: We offer a variety of the best HVAC produsts on the market, with warranties that gurantees the quality and protects your investment. Service: To ensure the life of the equipment by keeping it up and well tuned, and notifying you, the owner of any problems that may be occuring so that you can take care of them in a timley manner. Installation: Of equipment when old equipment is worn out to keep you cool through these hot summer days in Florida. Repairs: When your having problems and you need someone to hurry out and fix whatever it is. We have experienced tech’s that know how to handle the situation and get you back up and running in no time. Duct Repair: To keep your air moving freely through your home and making sure their are no leaks so you keep all parts of your home equally cool or warm like its supposed to be. 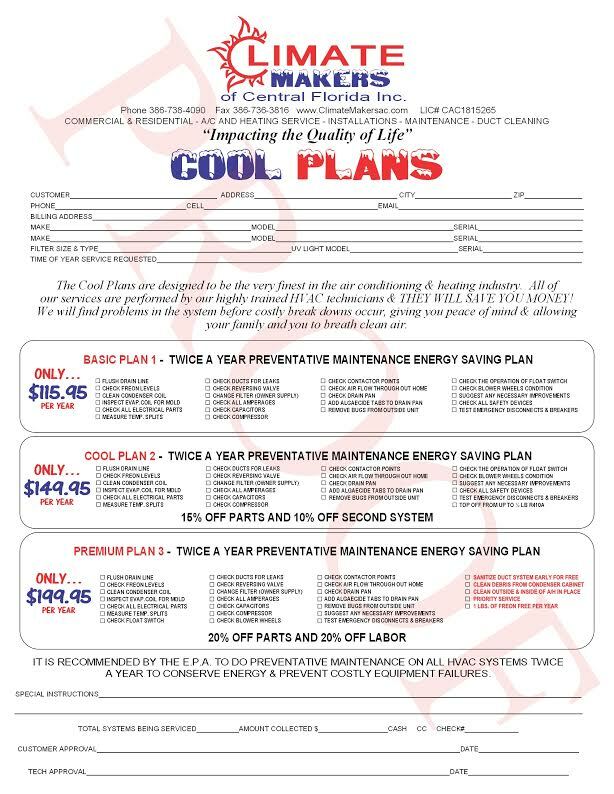 Climate Makers of Central Florida is Central Floridas’ best choice in HVAC service providers. We offer fast friendly service and we live by our mission statement to impact the quality of your life. We offer many services and discounts to put you, the customer in the best possible position, and comfortable in your home all at the same time. We have the best value in service agreements, tune- ups, and installation in your area, while offering flexible financing that we set up to fit your budget and abilities and time periods to pay. We have experts that have more than 30 years in this field and know what you need most of the time as soon as the phone call is made. So quick service is never a problem with our guys.So contact us today and make your HVAC worries disappear forever.